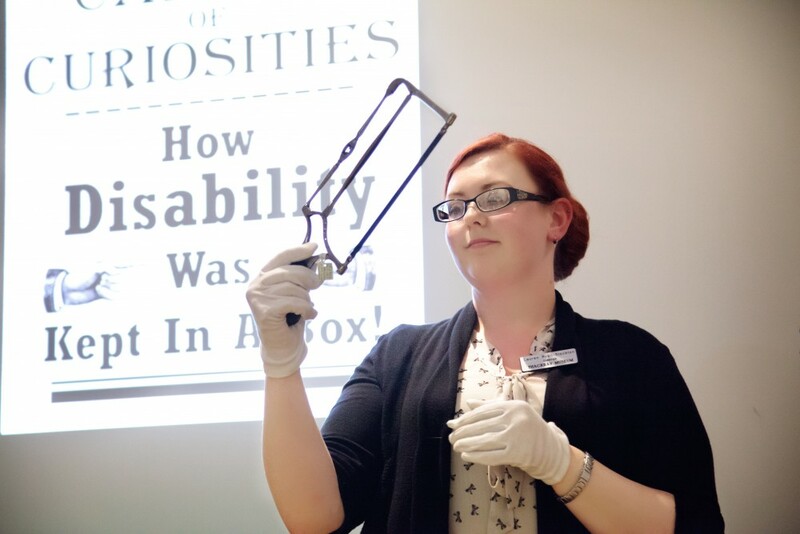 Lauren displays a surgical saw at the Cabinet of Curiosities event (Thackray Medical Museum, Leeds). I think there is a special privilege in caring for a museum collection, and I was very lucky to work with the amazing collection at the Thackray Medical Museum in Leeds for over seven years. The collection explores the material culture of medical innovation, with objects dating from Roman times right up to present-day medical devices. As well as the object collection, I helped to look after the library and archive, combining material culture with ephemera to create a wonderful resource which tells us much about the history of medicine. While every object was precious for what it could tell us about medicine, there are of course a few objects which I particularly liked. I had a favourite amputation saw, a beautiful Weiss British-style saw from around the mid-1800s, with a pressed horn handle that showed the maker name. I had a penchant for a particular Iron-Age scalpel, copper alloy handle with an Iron curved blade which was still intact; on the end of the handle was a little cast figure of a duck. The wonderful embroidered scroll by a lady called Lorina Bulwer, living with mental health issues as an inmate of a Norfolk workhouse in the early 1900s; the incredible First World War field surgery kit, the contents of which helped us understand the types of injuries the medics at the time had to deal with; the first kidney dialysis machine in the UK, imported to Leeds in the 1950s by Frank Parsons against the wider wishes of the Medical Research Council at the time. I could easily go on. The mid-twentieth-century collections in store at the Thackray Medical Museum, Leeds. All of the above begs the question, if I got to work with these wonderful objects, why then did I decide to return to University to explore medicine and emotion? For me, all of these objects are an emotional link to our medical past. They offer an insight into experiences we can now only read about and imagine. Holding my favourite amputation saw I discussed with colleagues, groups and researchers: who might have used it? ; How difficult would it have been to use? ; What would the patient think if they saw it? ; Did the patient survive? ; Did the surgeon cope? Holding it by the handle and not just seeing it through the glass of a display case gives an entirely different perspective on medics and patients throughout history, and I think the same can be said for every object in a medical collection, from the smallest lancet to an MRI scanner. How did this make people feel? I felt a strong pull to the emotional experiences of surgery, for the patient and the surgeon. It’s a commonly said phrase in museums ‘if only these objects could speak, what would they say’? I think some of the objects in medical collections would not just speak, but scream. The experiences they were part of are almost unthinkable to those of us living in a society with free-at-the-point-of-access emergency healthcare, and pain-free surgeries, with a much better chance of survival than many of our ancestors. I wanted to understand further the experiences of our medical past, and emotions are part of a cohesive understanding. Sometimes the material culture is difficult, encompassing pain and fear like the amputation saw. When I looked at difficult material culture with groups, regardless of the audience, the most commonly discussed response was empathy. I hope that through this project we can better understand historical empathy, and because of this develop a greater appreciation of our medical past. For more information about the Thackray Medical Museum, visit its website here.